Searching for a fresh cultural identity and nationhood and the Indian Government’s commitment to support the arts on a massive scale was conspicuous with the establishment of major cultural organizations. The first Prime Minister of independent India, Pandit Jawaharlal Nehru conceived and set up major art and cultural agencies to rejuvenate and formulate the diverse Indian cultural practices and promote them to play a comprehensive role in the making of the nation. The main thrust of these organizations was artistic excellence. 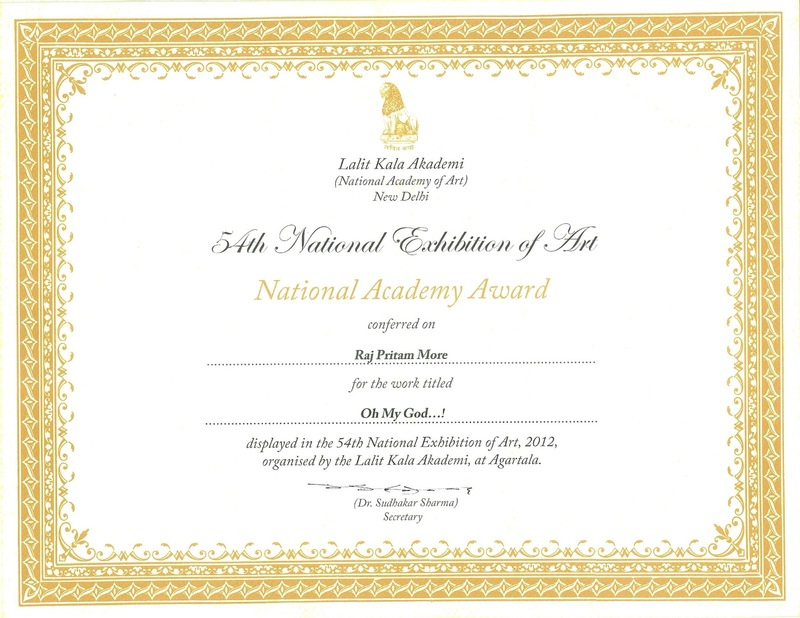 Lalit Kala Akademi, National Academy of Art, New Delhi, was one among such national organizations that was established by the Government of India in 1954. It emerged as the principal establishment that ensconces a wide array of its activities in the field of visual arts. The Honourable Former Union Minister for Education, Maulana Abul Kalam Azad, inaugurated the Akademi on August 5, 1954. In his inaugural speech, he quoted that, “the objective of Lalit Kala Akademi is to preserve the glorious traditions of the past and enrich them by the work of our modern artists. It must also seek to improve standards and refine public taste“. Since its inception the Akademi has made remarkable progress in this regard and has achieved major goals under the leadership of visionary members like Mulk Raj Anand, B.C. Sanyal, K.K. Hebbar, Karl J. Khandalavala, Debiprasad Roy Chowdhury and Sankho Chaudhuri, who have contributed immensely in the popularity of Indian art. The Akademi is an autonomous body, which is fully funded by the Ministry of Culture, Government of India. It has substantial independence in formulating decisions related to national and international exhibitions, events and providing financial assistance to artists and art organizations through scholarships and grants. In this context, the Akademi selects suitable practitioners to receive grants. Since its establishment, the Akademi has been serving the country by promoting creative endeavours of Indian artists and bringing their arts closer to a large number of audience; thereby playing an important role in defining and redefining the sensibility of India’s visual culture. Lalit Kala Akademi is an institution that rendered service to the arts in the nation long before the world woke up to the global impact of Indian art. Through the initiatives of its members and staff, Lalit Kala Akademi manifests a commitment to the service of arts by establishing, preserving and documenting art of the highest order that reflects the vitality, complexity and unfolding patterns of modern and contemporary art in India. All through the year it presents exhibitions and educational programs of unparalleled significance. It sustains a library, art collection, archives, conservation laboratory and gives scholarships and brings out publications of pre-eminent intellectual merit. Pivotal to the Lalit Kala’s mission is the encouragement of an ever-deeper understanding and enjoyment of modern and contemporary art by the diverse local, national and international audience. The National Exhibition of Art and the Triennale-India are endeavours that have been held to cater to its quest for discovering new artistic trends. 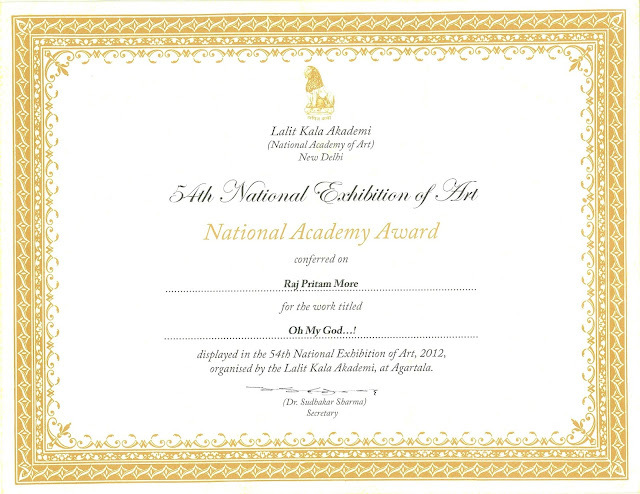 The Akademi’s sincere commitment for the development of arts is evident through the national and international exhibition programs organized by the Head Quarters in New Delhi and by the Regional Centers situated at Bhubaneswar, Chennai, Kolkata, Lucknow, Shimla and Garhi, New Delhi. While providing further opportunities for emerging artists the Akademi emphasizes to foster appreciation of arts and engagement of the audience to associate with art and culture. 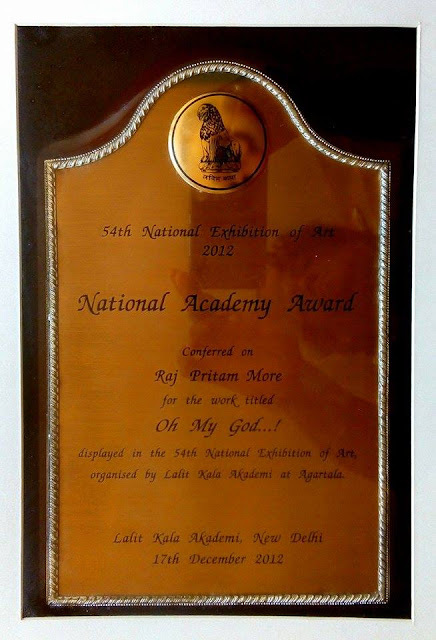 The Akademi strongly focuses on shaping a future India in which arts play a meaningful role in everyday life. As a cultural body that hovers above the entire Indian subcontinent, it plays a role to inter-link the diverse cultures of India to weave up a cultural spread that is magnificent for its colourful threads of creative genius and brilliant designs that delineate fascinating features of Indian life. Perceiving the Indian culture comprehensively with all its artistic impulses, conflicts, contradictions and limitations, the Akademi has been functioning with a panoramic view to involve all genres of creativity in its activities. It has a vision that takes care of the traditional art of India as well helping artists to imbibe many of the contemporary happenings in the International art scene. SK1. 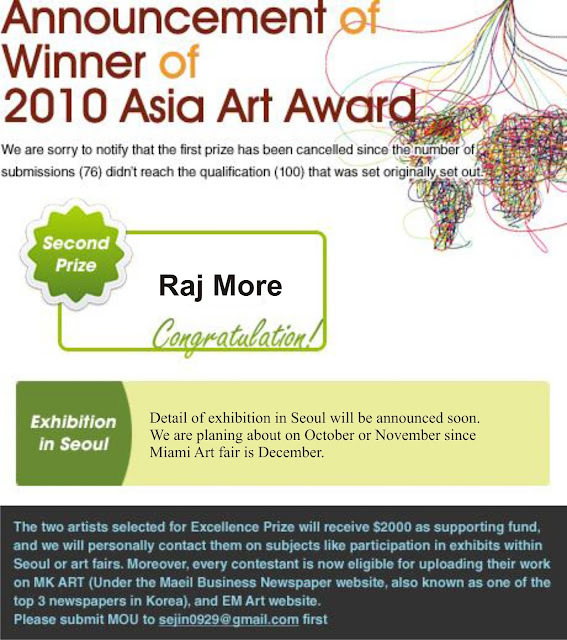 You are the winner of 2010 Asia Art Award. How do you feel? Raj: I felt like a dream come true & it honour to me.it stimulated me to work harder,its feel good. SK. When you apply, did you have a plan to advance to Korea as a artist? Raj:I get a information about this Award on Facebook,this year i apply for this contest.I wanted to now about Korea & its culture as an artist.Definitely wanted to move & work there. SK3. How do you know about Korean Art? Who is your favorite? Raj:I alway like a Korean Art.Korean Art is fascinating although it has been deeply influenced by chinese art,still pursing it own path.Korean art an interest all its own.Korean artists could look back on a tradition of painting,renderings of older more traditional techniques and subject.Now a daysKorean art make his own paltform in Asia contemparary art.I like korean artist as Kwan young Soul & Cha Hyan Sea...both of works i like it. .Raj:Now Indian art is growing very fast because they have not influence of any one art.Indian art have it own spirt,cultural complexity & charm to Asia. SK5. What is improvement of Indian art? On the other hand, what is weakness of Indian Art? Raj:Lots of improvement in Indian art.lots of Art fairs & international gallery come to india...so many auction houses doing well with Indian art.All around the world,ppl like Indain art.Indain artist doing well & make his own marks.On other hand there is no weakness in Indian Art,after same recession in all the art world.Now all thinks going well....Big Art fairs is coming,art market doing well. SK6. What is your plan for your work and exhibition in the future? Raj:Just to keep on working...in any circumstances.I am working on a project on New Delhi'''C 4 Delhi''.I make video,paintings & installation on it. SK7. How do you and your works want to be introduced in Korea? Raj :I am working on my culture & thoughts,so i would like to introduces my work on this way. You get a Excellence prize $2000 as supporting fund.